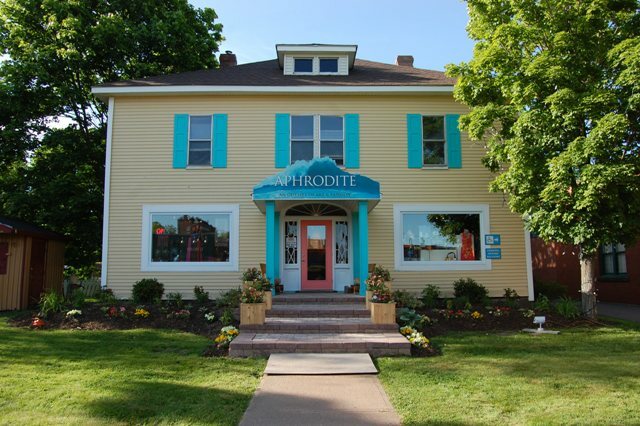 June at Aphrodite – The Odyssey Continues…. June at Aphrodite – The Odyssey Continues. Valeska Meyer has graced our pages by modelling some Aphrodite fashions. She’s a great spirit who looked amazing in everything she tried on. 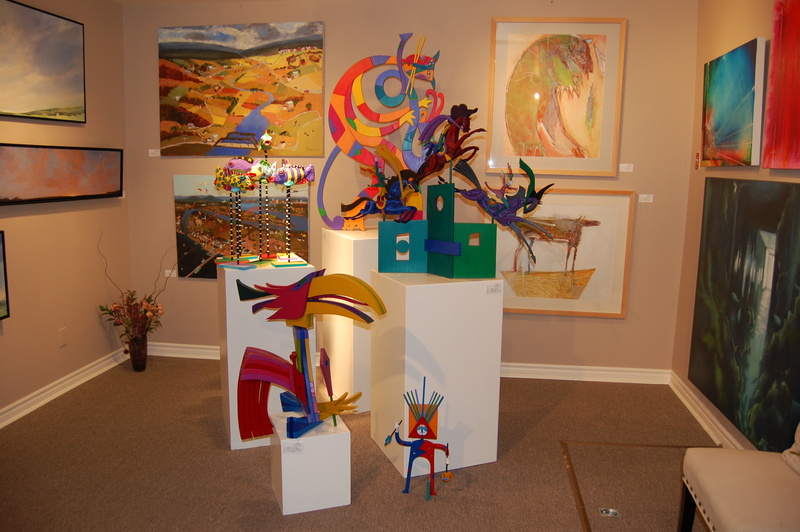 Here she is admiring some of the new paper mache fishies in our gallery by artist Sarah Quintin from Sackville, NB. And she’s wearing a stunning dress by Bodybag. 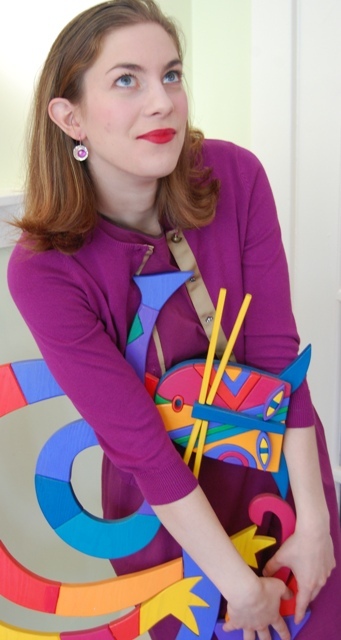 Valeska with one of our fabulous Karen Wilson handbags handmade in Oakville, Ontario. We also have Michique in bright spring colours. They’re those happening purses from Sydney Cape Breton. BTW she’s wearing an amazing dress by Bodybag from Montreal. 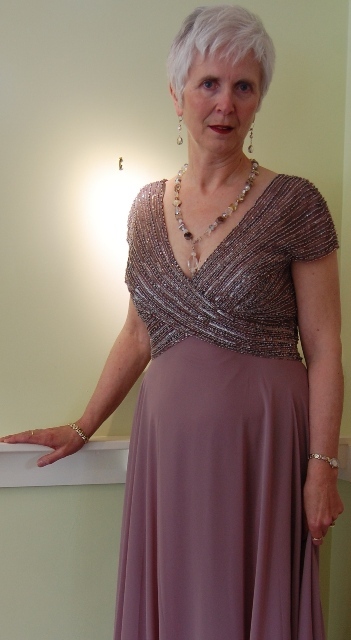 The ever beautiful Mary Connoly (Aphrodite sales associate) wearing a glitzy long mother of the bride dress by Terani and some gorgeous Glam “bling” jewellery. We just got another large shipment of Glam last week after the first one sold out in a few weeks. That’s Valeska hugging a Verner Arnold sculpture – I didn’t tell her to do that – she’s just silly that way! She’s wearing the cutest Nougat dress and sweater combo. Speaking of which – we rearranged the gallery to feature some new artists – Craig Rubadoux and his “Truro Bear” painting for one. Some masterful watercolours by Annapolis Royal artist Louise Williams and Anne Marie Johnston from Halifax to name a few. In our craft gallery we have also added some divine fresh roasted organic, fair trade coffees by “Sissiboo Coffee Roaster” in Bear River and some lavender and chili lemon preserves and condiments from “Sledding Hill” also from Bear River. These are divine artisinal products wonderful to serve or as hostess gifts. 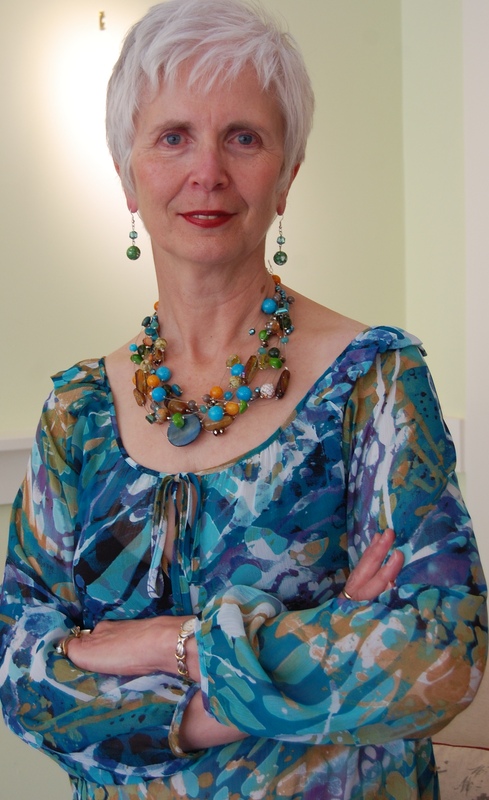 Mary’s looking so pretty in one of our gauzy new tops by Papillon Blanc and Glam jewellery. Check out her gorgeous hair – she cuts it herself! Valeska’s dress cascaded from short to long when we released the ribbons under the hem. Then we paired it with a sweet shrug and look what happens when we add the pendant and earrings from Bear River artists Green Willow Studios. These pendants are enamelled in vibrant colours and different on both sides. Another great Kollontai piece topped with a cotton and modal (bamboo) Origami sweater by Lilla P. We just ordered more from this designer – the softest and most luxurious versatile knits so cooool for the summer. Valeska’s also wearing another wonderful Nervous System necklace. Mary tops off a beautiful Nougat long dress with a handmade one of a kind silk top by Cape Breton artist Jasmine Jones. Kollontai dress and Karen Walker sunglasses – what a great look! We have a totally glamourous selection of high quality designer sunglasses guaranteed to turn heads. Check out this incredible little suede jacket by Bod and Christensen.Worn with Not Your Daughter’s Jeans and topped off with some jewels by Karly Smith – Mary looks the business. The wide belt by “Not the Same” just gives it that edge. 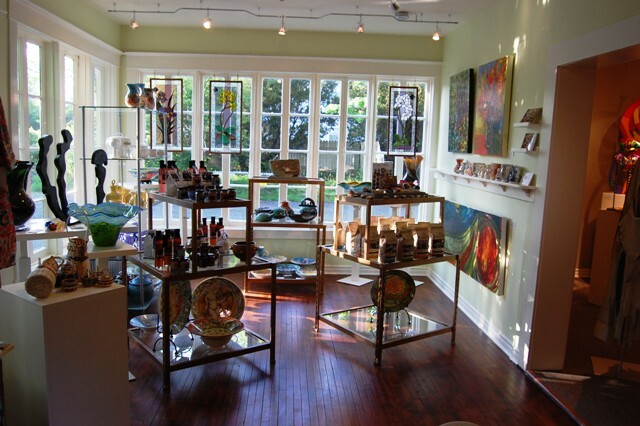 Finally – the store in it’s summer glory. Note the beautiful planters that my partner Minoli Amit arranged recently. I do the indoors – she does the outdoors. Stay tuned – there will be more pictures! Better yet come and visit us and see for yourself!